For an overview on Urinary Pyrrole analysis written by Brett Lambert of Applied Analytical Laboratories Brisbane, please see below. Here Brett goes over the important questions often asked about how a sample should be collected properly, what pyroluria is, some important references and also a brief history of himself… Brett Lambert (M.AppSc, B.AppSc(Chemistry)), Director, Applied Analytical Laboratories, Pty Ltd. 8/26 Nestor Dr, Meadowbrook Qld 4131 Ph 07 3133 1615, email: info_apan@bigpond.com . Urinary pyrrole (hydroxyhemopyrroline-2-one or HPL, Mwt; 123gmol-1) is a labile intermediate lactam generated during the oxidative degradation of heme and its derives (biliverdin, biliruben and urobilinogen) in situ1,2. . Increased excretion of HPL can result from a range of factors including (but not limited to) a genetic disorder affecting haemoglobin synthesis, the accelerated oxidative degradation of heme and its derivatives (a form of oxidative stress), or from the disruption of this endogenous cycle and has been described as a common feature of many behavioural disorders (also referred to as Pyrroluria)3,4,5. HPL is detectable in human urine, faeces, blood, and cerebrospinal fluid and can be eliminated by dialysis6. A practical and reliable blood test for HPL is not possible due to the myriad of interfering substances12, thus urine remains the preferred testing substrate. 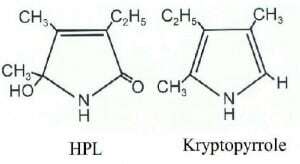 In fact, the most common (and very high) false positive results arise from the presence of blood in the specimen. . HPL is commonly mis-represented as kryptopyrrole (Figure 1), a chemically similar compound used as the standard for colorimetric HPL assay7. This distinction has been confirmed by synthesis8,9,10, Gas-Liquid chromatography (GC)10 and liquid chromatography-mass spectrometry (LC-MS)12. These methods compared favourably (linear r=0.98) with the colorimetric method used in this laboratory12 (urinary HPL levels are measured quantitatively by solvent extraction, reaction with a developing reagent, and spectrophotometric measurement at 540nm)4,7. Second morning void (or random – providing it’s not the first) specimens are collected into vials containing preservative, and snap frozen (-30oC). Samples are transported on dry ice (-30oC) to ensure the temperature remains constant and they remain frozen and protected from light until analysis. . Figure 1 – HPL and kryptopyrrole chemical structures. HPL is very reactive and decomposes as soon as it leaves the body. It has a half-life of 10-12 hours11 (which means that if not frozen, after the first 24 hours, the level of HPL in the sample will be approximately 20% of the original value and 5% of the original value after 48 hours – which is also dependent on ambient temperature and other factors). In terms of results, this property results in enormous variability (which is not desirable for a reliable diagnostic test). In early development work on the urinary pyrrole test in Australia by this author, it was also found that exposure of samples to direct sun-light (or collection in a room illuminated by direct sunlight) resulted in almost instantaneous elimination of all HPL activity. In almost all cases in this laboratory, no detectable HPL has been found in samples that have thawed during transit (or arrived unfrozen). As a laboratory providing a national diagnostic service, it is imperative to provide the most reliable, accurate, precise, and consistent results as possible and as a result we have developed a uniform collection and transport protocol for all samples. The freezing of samples (and for them to remain frozen until analysis) is crucial to the successful and accurate analysis of urinary HPL at this time. In the future, Applied Analytical Laboratories will be introducing a technique (currently under development) for room temperature stabilization of the analyte using a novel process. This technique has shown promise, however more validation is required before roll-out. . The working ranges for urinary HPL levels using the method employed at Applied Analytical Laboratories are as follows: . [HPL] < 10μg/dL: Normal 10 μg/dL <[HPL] > 20μg/dL: Borderline [HPL] > 20μg/dL: Elevated These ranges have been validated by clinical trial where mental health in-patients (150) and controls (50) were tested. .
1.Stryer, Lupert, Biochemistry, 2nd edition, 1981 P.507-508, Freeman Press 2.http://en.wikipedia.org/wiki/Urobilinogen 19/08/2012 3. McGinnis, W: Pyroluria: Hidden Cause of Schizophrenia,Bipolar, Depression, and Anxiety Symptoms. International Guide to the World of Alternative Mental Health. Orlando 21May 2004. 4. Hoffer, A.H. “The Discovery of Kryptopyrrole and its importance in diagnosis of Biochemical Imbalances inSchizophrenia and in Criminal Behaviour”, Journal of Orthomolecular Medicine, Vol 10, No.1, 1995. 5. William J Walsh, Laura B. Glab, Mary Haakenson; Reduced violent behaviour following biochemical therapy, Physiology & Behaviour 82, 2004 835 -839. 6.Durko I, Englehardt J, Szilard J., et al; The Effect of haemodialysis on the excretion of the mauve factor in schizophrenia. J. Orthomolec Psychiatry. 1984; 13:222-232.3 7. Sohler A, Holsztynska MS, Pfeiffer CC. A Rapid Screening Test for Pyroluria; useful in distinguishing a schizophrenic Population. J. Orthomolec Psychiatr. 1974; 26:21-28. 8. Wooldrige TA, Lightner DA. Synthesis of “oxidized” hemopyrrole and kryptopyrrole: porphyric monopyrroles. J Heterocyclic Chem. 1977; 14:1283-1284. 9. Irvine DG. Pyrroles in neuropsychiatric and porphyric disorders: confirmation of a metabolite structure by synthesis. Life Sci. 1978;23:983-990. 10. Irvine DG. Hydroxy-hemopyrrolenone, not kryptopyrrole, in the urine of schizophrenics and porphyrics. Clinical Chem. 1978;2069-2070. 11. Graham DJM. Quantitativedetermination of 3-ethyl-5-hydroxy-4,5-dimethyl-[delta 3]-pyrrolin-2-one in urine using gas liquid chromatography. Clin Chim Acta. 1978; 85:205-210. 12. McGinnis WR, Audhya T, Walsh WJ, Jackson JA, McLaren-Howard J, Lewis A, Lauda P, Bibus DM, Jurnak F, Lietha R, Hoffer A . Discerning The Mauve Factor, Alternative Therapies, Vol 14 No.2 – 3; 2008. .
Author’s Brief History. Brett Lambert is a highly qualified scientist with over 25 years’ experience in research & development (pharmacology, pharmaceutical lead discovery, separation science and structural elucidation), as well as commercial laboratory management. Brett was approached in 2003 by the Bio-balance Health Group to determine the feasibility of urinary pyrrole analysis in Australia. Laboratories provides a urinary pyrrole analysis service for medical practitioners through national pathology collection agencies and its analysis method has been developed to provide a reliable and consistent testing service to all regardless of geographic location. Myself and my two daughters tested positive for Pyrroluria this year. Our tests were transported to QLD from Victoria for testing, and I was completely amazed and grateful for the wonderful support provided personally by Brett. Brett kindly shared with me a wealth of information to assist with the journey of treatment and the expectations we should and shouldn’t have in relation to treatment. I would highly recommend anyone considering undertaking testing to use Applied Analytical Laboratories for their testing. Accuracy is so critical, and to know your test is being reviewed by the most experienced laboratory in Australia – well you know you are in good hands! Thank you Brett. Hello, I saw a segment on the Today Tonight show on channel 7 Perth. I would like to know how to complete the unrinary test for Pyrrol Disease and if there is a laboratory here in Bunbury or Perth to hand the urine test into. I looked at the symptoms listed and can relate to 25 of them. I am currently on medication for anxiety, depression and obsessive thinking and this disorder seems to run in the family. Hope you can suggest how I can begin the testing etc or where to start. Anyone who requires testing can contact me via my contact page and I will email the necessary sheet for the collection that can be done at certain pathology collection centers around Australia. I am then able to do an in clinic, phone or skype consultation to discuss the results, or you can take the results to someone local that has experience with treating Pyrrole disorder. Is there some where in Sydney where have this test done? Wherever there is a pathology collection center, you can get the test done, but you first need a pathology request sheet for the pyrrole test. I can send one to you if you contact me via my contact page. Can you tell me if I can rely on a Pyrrole reading when the sample had:: no preservative in container, was left on the collection counter for at least 10 mins & was apparently lost for a day somewhere.?? Melbourne?? Queensland..?? The reading which came back was 90..I do not have symptoms of Mauve but had the test done as my daughter apparently does have the problem . I do not wish to take the GP prescription if I actually do not need it… so confused. Helena . How Can i test if i have pyrrole disorder ? And What does that test cost ? And how much does it cost to gwt help concerning The treatment ? I live in Denmark.